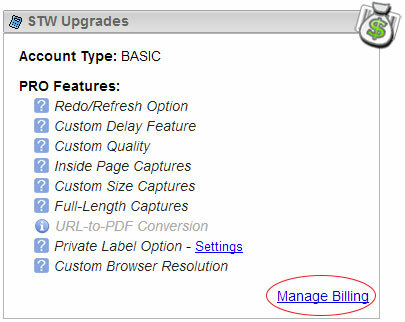 Step 2: Click the "Manage Subscriptions & Billing" link located below the PRO Features List. Invoices are emailed now (no PDF versions). If you do not receive your invoices, you should check with your email provider to inquire regarding the issue. Once you are certain that shrinktheweb.com is added to your email whitelist, then you may open a support ticket and request that your invoice(s) be re-sent to you.